The Universal Goddess Tarot by artist Antonella Platano is a tribute to female deities in ancient cultures, traditions and myths. Featured Goddesses range from the most well-known to the obscure, while the art manages to express their unique character and cultural heritage while keeping the deck unified as a whole. 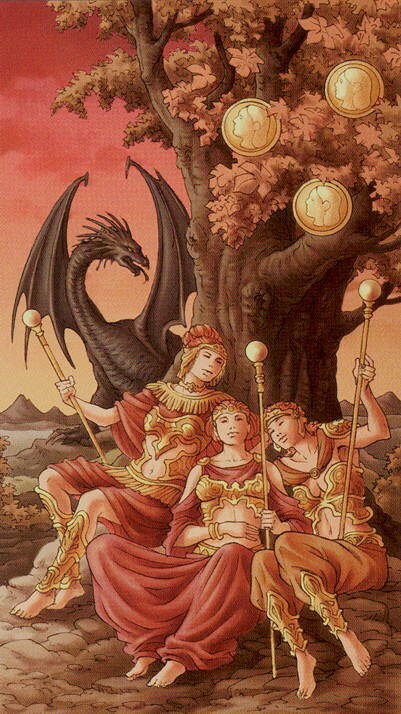 The Three of Pentacles card reveals the fantasy nature of this deck, with three Goddesses, called the Esperides, Greek nymphs of the sunset. They are shown in an enchanted garden, with an enormous black dragon emerging from behind the tree in the background.